I want to blow up the Palace of Holyroodhouse. I am a republican, and I believe in the equitable distribution of resources for life including land and housing, and I believe in the destruction of the kyriarchy through radical militant action. For all of these reasons, whenever I walk past the Palace of Holyroodhouse I involuntarily become indescribably furious and start fantasising about blowing it up. However, I am frankly terrified of the consequences this would have on my life, and think it probably wouldn’t be worth it. Therefore, I’ve decided that I will instead, in a symbolic action, blow up a scale model of the Palace in the name of art. I Would Like to Blow Up the Palace... is a performance about rage, politics, the limitations of art and activism, and discovering what the state can do to you. 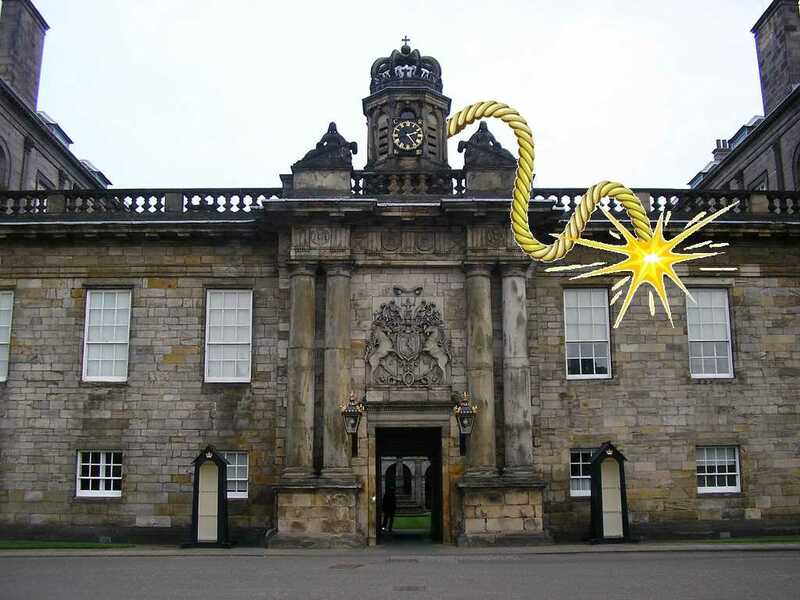 The performance consists of the three phases: (1) the active period of research involved in figuring out how to build a scale model of Holyroodhouse and then legally blow it up, which will take place in public, preferably in arts venues; (2) the actual blowing up of the model Palace; (3) a performance lecture about how and why I did it and what happened. I’m inaugurating Phase 1 this week at the Forest Café, Edinburgh. From 3-7pm I will be present with a laptop and a pile of flipchart paper. I will be researching how, practically and legally, to make a small explosive, build a model palace, put them together, and then detonate it somewhere in public. All interactions and monitoring efforts are welcome. I hope you’ll see me there, even if I don’t see you. If you have access to space in an arts venue and would like me to research bomb-making in your space, please get in touch. This post is the first public statement about the project following two emails and a handful of conversations. I will be recording all documentary evidence, up to an including my private thoughts on the matter, in an auto-surveillance dossier in order to spare the public purse. Please note that all comments and mentions of this post will thus be monitored for monitoring purposes. And a lot of bloody nerve! But it’s better if I missed you! I assume you don’t have a problem destroying the 800 years of history that this place holds for Edinburgh & Scotland? It probably be easier to assassinate a royal for forest cafe hipster to get anywhere near this joint. I have many problems with the idea of destroying 800 years of history, yes. I tend to think that almost everything I do is in some way problematic, dangerous or stupid. And I certainly think most political action is full of compromise and risk. I’m really interested in what different buildings mean to different people, and how they can become magnets for emotion; I’m also interested in what happens when buildings get demolished and why, whether that’s council mandate, business redevelopment, or terrorist action. I think whenever a building gets destroyed a lot of important stuff tends to happen: in many ways, the repeated destruction of buildings is something that defines contemporary urban life. Fortunately, the model of the Palace I will be building and demolishing will have only a year or so of history, and so I don’t expect many people to put up too much of a fuss.